On Friday, Riverfront Park was filled with passengers of the American Queen as well as local spectators. The passengers were given tours during the day of Main Street and Fort Randolph. The American Queen is the largest steamboat ever built and is described as having an interior with an American Victorian era feel, but filled with modern amenities. The ship has is said to have glistening woodwork, fresh flowers, and antiques on board. The American Queen continued her journey up the Ohio River on Friday after the visit to Point Pleasant, and is expected pass by the region again next week on its return journey from Pittsburgh to Louisville. 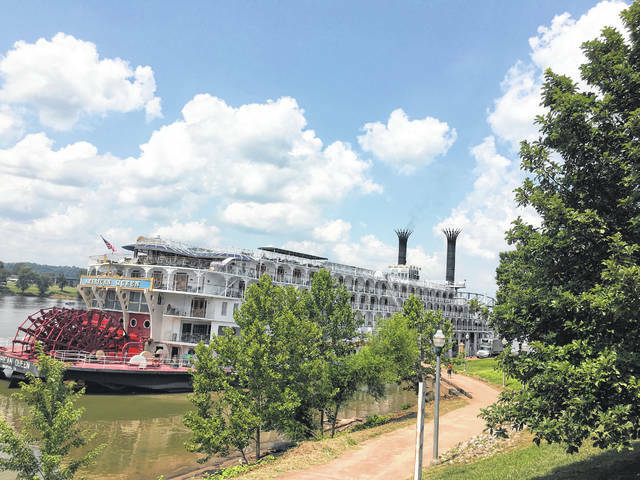 https://www.mydailytribune.com/wp-content/uploads/sites/42/2018/07/web1_0714.Queen_.jpgOn Friday, Riverfront Park was filled with passengers of the American Queen as well as local spectators. The passengers were given tours during the day of Main Street and Fort Randolph. The American Queen is the largest steamboat ever built and is described as having an interior with an American Victorian era feel, but filled with modern amenities. The ship has is said to have glistening woodwork, fresh flowers, and antiques on board. The American Queen continued her journey up the Ohio River on Friday after the visit to Point Pleasant, and is expected pass by the region again next week on its return journey from Pittsburgh to Louisville.